1. All Alumni visits to campus must go through Vallen Queen (vqueen@pausd.org) in the Main Office. She will put the event on the calendar to avoid conflicts. 2. For onsite events, at least one member of your Planning Committee must provide Vallen with a written request including but not limited to the event date, time of event, number of people attending, activities planned (Paly tour only? Catered event? Other?) facilities requested such as Student Center for catered event, bathrooms etc. 3. Organizing group may need to purchase one-day insurance (TBD). 4. The organizing group must pay for custodial service, if required and if there is no custodian available on site. 5. There is no rental charge for Alumni events. 6. If using the patio, use of the umbrellas can be requested if they are available. Also be sure to ask for a key to unlock chairs from tables - not always unlocked. 1. For an alumni class that wishes only a tour given by a Paly Staff Member or Alumni Board Member, no insurance or custodian is needed. A $50 donation is requested. 2. For an alumni class that wishes a tour and then would like to visit on the patio (not including a catered meal) with a Paly Staff Member or Alumni Board Member present, no insurance or custodian is needed. 3. For an alumni class that wishes a tour given by a Paly Staff Member or Alumni Board Member and includes a catered meal in the Student Center, on the Tower Patio or an event on the Quad that requires set up and clean up, custodial help will be required and a charge for hiring a custodian exclusively for this event will be assessed. 4. For arranging a Campus Tour,please contact Edie Miller (palyalumni@gmail.com) or Arne Lim (alim@pausd.org). 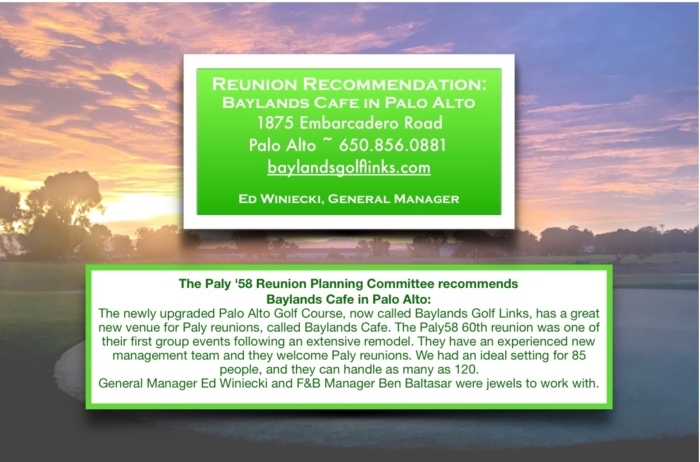 IMPORTANT: There are no funds available through Paly for reunions. Each class needs to provide their own reunion funding. See info about donations under Finances. Events can be held at Paly (see Paly Policy for Alumni Use of Paly Site above for details). Please notify palyalumni@gmail.com of your plans so she can post it on the Alumni calendar/website. ORGANIZE at least one year in advance - this helps with locating classmates and reserving venue(s), etc. 1. Form a Reunion Committee. Select a Coordinator/Chair. Recommended: Select your most detail-oriented person for your Committee Chair or Assistant. The success is in the details and organization, organization, organization. 2. Although it's better for your Chair and Reunion Committee to make the decisions, If you wish, take a poll by email/social media for the best date, type of function, etc. Be aware that the more people you poll and the larger the committee, the more variation in responses. 3. Finding Classmates; email and ask other classmates if they have contact info for other classmates; use Facebook, etc. If you want to pay for a search website, there are resources such as Vimeo, Truthfinders or Ancestry.com or you may choose to hire a search company. The latter gets expensive. Ask siblings, or children, search CA and NV databases for marriage records. If class is older, find parents' obituaries for last location of next of kin. If you're brave, locate ex-spouses if you have info. 4. Paly Alumni and Friends will print one list for the respective class (from the 2017 Paly Directory) or send it via email to ONE member of your committee. Because of confidentiality considerations, do not circulate list. AVOID Stanford at-home Football Game Weekends, Stanford Back-to-School and Parents' Weekends if you will need hotel space or access to Paly's parking lots. If using Paly, conflicts can include Saturday Flea Markets and SAT testing. Check with Paly's calendar. 1. Consider the overall spending limits of your classmates--then make a plan that most can afford. 2. Ask for donations for "seed money" to help with initial costs or possible "scholarships" for those with financial limitations. 3. Don't include donations to any special cause--too controversial. Price the event at cost. If there is money left over either save it for your next reunion/get-together or donate it for Paly Scholarships or to the Alumni General Fund. 4. Include cost of mailings, venues, band, photographers, flowers, decorations, and prizes etc. in the ticket pricing. 5. Set up a separate bank account under the Reunion Class and Year name as a (DBA) if possible. For checks and balances, require two signatures (highly advised).If your class has a CLASS CREATOR website, it is easy to get payments through them. 6. Alcohol: many classes like a no host bar, others include drink tickets in the price to be redeemed for one's choice. 7. Try to include some No-Cost Events: Bring-your-own picnic for families. Include a tour of Paly (a $50 donation is requested: Contact: (palyalumni@gmail.com) and/or drop in. A No-Host Friday night - (at The Sheraton Hotel Bar- notify them in advance) or Antonioʼs Nut House or at a Private Home. Or patio at Westin next door to Sheraton is nice. 9. Charge less if classmates pay before a certain date. Be sure to have a cut-off date regardless. 1. Send a postcard/social media notice - "Save the Date' about 9 months in advance. (Mail with First Class postage and include a return address that way you'll find out which addresses are no longer good). Request email addresses. 2. Send one invite/order form mailing. Most invites can be done via email to save on expenses. Only send invite/order form to those who don't use computers/email. This will save on expenses. 3. Set up a Facebook page or better yet, a class website - If you use ClassCreator for your website software, reunions can be run through the website and classmates can pay with credit cards very easily. (For a sample of a ClassCreator webpage see: www.paly61.com). The Sheraton, Palo Alto Art Center, Lucie Stern, Country Clubs e.g. Los Altos, Circus, University, Foothills, Fremont Hills, Ladera; Holbrook Palmer, Elks Club, and area wineries. Gamble House for smaller groups. Michaels at Shoreline*, Cabana aka Crowne Plaza Hotel, etc. University Avenue bars-- you will need to check which can best accomodate your group size. Paly (picnic-some cost, no alcohol- see above for rules). Town & Country Cheese House will provide sandwiches, etc at a reasonable price and deliver to Paly if arrangements are made in advance or everyone can provide their own. Arrange and negotiate with hotels for blocks of rooms at a good rate a year in advance if possible. Use several hotels at varying rates. Be sure to provide this information on your website/Facebook or written communication to classmates well in advance. Hotels will often provide "shoulder nights" on either end of the reunion at the same rate--be sure to ask. Make sure to arrange cut-off dates with the hotels when reservations at the special rate can no longer be accessed. Also communicate this info to classmembers. You can set up a MENU item on your website with all of the hotel information. 2. Good to have memory books/updated class lists available at the event or shortly thereafter. FOOD Good and sufficient food is IMPORTANT!!!! Buffet or food stations allow people to circulate and converse. If you have a large group and a buffet set up, it's imperative that you have two lines running simultaneously that can be served from both sides. HIghly recommend drinks and desserts be located at very visible, separate stations away from the Buffet lines. MEMORY BOARDS - photos, yearbooks, old Campaniles, trivia games, or an art show. Consider hiring a photo booth! A special location at the reunion for listing those deceased. Could have an empty chair with a white rose across the seat with a list posted behind, or a board with the pictures, names and deceased dates. Although it's nice to pay respects to deceased classmates, remember that your reunion is for the living. Some people read through the list of deceased classmates and ring a bell after each name is read -- not recommended. PHOTOS - Gather photos of past reunions or Paly days. Run a continuous loop CD/computer slide show on screen or wall. Add new photos and sell CDs for seed money for next reunion. MUSIC - Band? DJ? - Adds atmosphere - just make sure it isn't too loud--guests really want to talk! Older reunion classes seem to prefer no music (due to hearing issues especially with a large group and the ambient noise making it difficult). Group dancing (line dances, stroll etc, good). One class hired a Steel Drum Band (steeldrumbands.com) to play at their No-Host Friday Night Kickoff Event. a. Alternatives: Piano Player. Record music to be played through the venue's audio system, or on an MP3 player. Give CDs as prizes. ENTERTAINMENT - Most classes come to a reunion to talk with one another and get reacquainted.Therefore, entertainment usually isn't needed. That being said, sometimes an especially talented classmate may play the piano, another sing a song or two or even have a classmate or classmates put on a very short skit. There is also a band, "Wild Cats" a "Dad's band" will perfom at events. Most of the Dad's have or had children who went through the PAUSD school system. All monies from their performances provide supplemental fund ingto worthwhile programs to the Palo Alto schools district-wide. (See article). https://www.alumni.hbs.edu/stories/Pages/story-bulletin.aspx?num=4882&cid=alumninews-oct2015b . Send us an email using Contact Us on the website Menul for contact info. Arrange for a professional photographer to photograph your event. If possible, create a place/space where everyone can have their picture taken so no one is left out. Don't use a classmate as the photographer or they won't get to enjoy the reunion. Ask classmates who take pictures on iPhones/Smartphones to share their photos with website Admin to be included on class website. 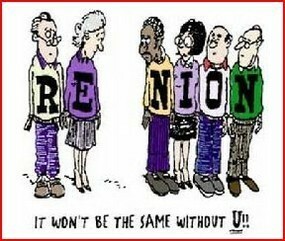 Make sure they identify people in their photo (particularly for upward years as in 50th reunions--people change a lot!). One classmate brought a couple of laptop computers and had everyone record their thoughts about the reunion.Definitely arrange for a good, quiet area for this or all of the background noise will be heard and the individual's message drowned out. Video companies can be hired to tape event and sell to class members -- no charge to committee. SPECIAL CIRCUMSTANCES: Consider that you will have Alcoholics and Recovering Alcoholics at your reunion. A nice accomodation for them is to have a room reserved in a hotel (some hotels will provide a free room if you have a block of rooms there) for them to meet for a "Friends of Dave" meeting. That moniker is the socially accepted term for an AA type meeting. You may know of one of your classmates who is a recovering alcoholic who could tell you how often they should meet during the weekend along with the best time(s). You can discreetly arrange this room ahead of time and provide the information privately or on your website to those who have the need for this support environment during your reunion.